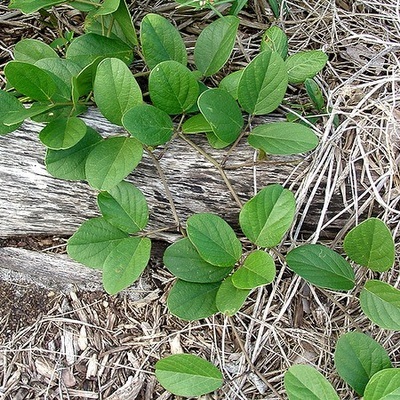 Baybean is a beach and dune legume able to creep across bare sand or to climb trees and shrubs. 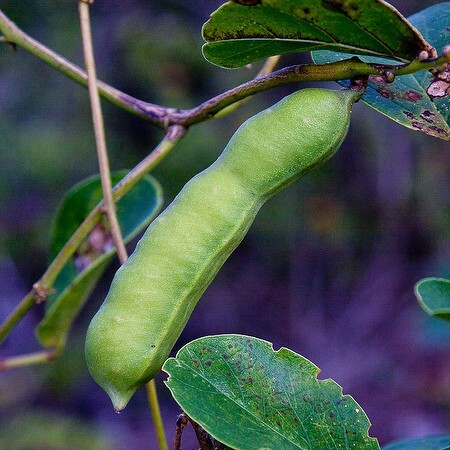 The trifoliate leaves (having leaflets in 3's) are distinctive along with a violet pea-type flower and thick flat legume pod. Cowpea (Vigna luteola) has similar but smaller trifoliate leaves, and yellow flowers. 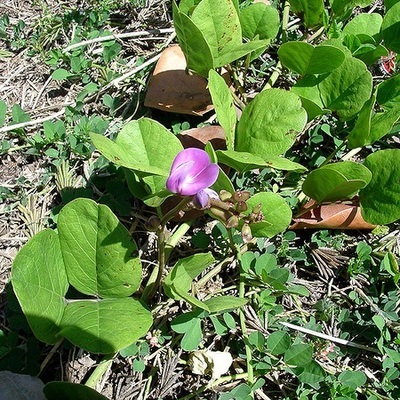 Cowpea may appear on beaches and dunes too. Baybean has a toxic seed and dangerous drug uses, which you can explore in the blog. 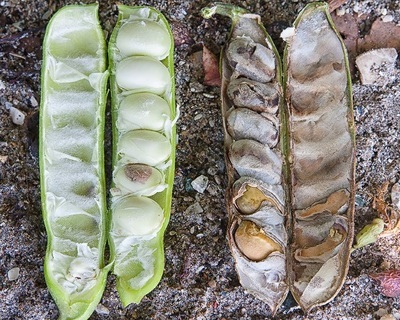 The seeds are among the “sea beans” collected by beachcombers. 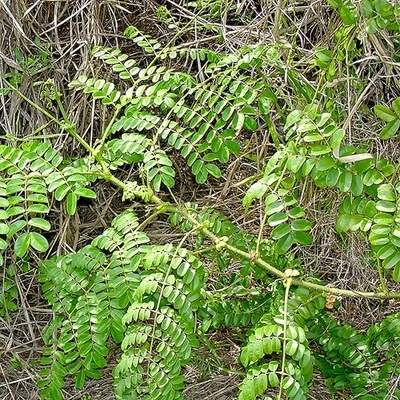 This hammock and dune legume is a thorny shrub or small tree. 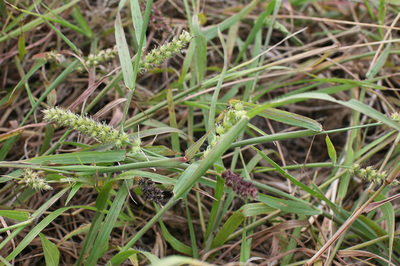 The leaves have three leaflets, and these are lobed. 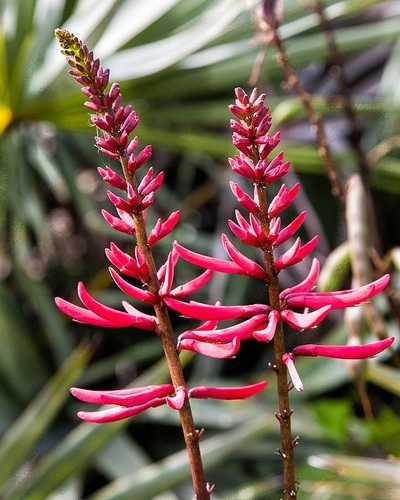 The showy hummingbird-pollinated flowers are red and tubular. 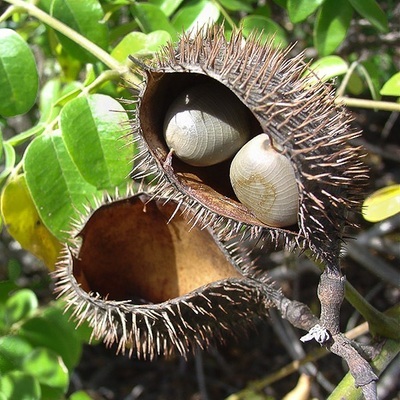 The fruit is a legume pod containing large seeds having red and black markings. 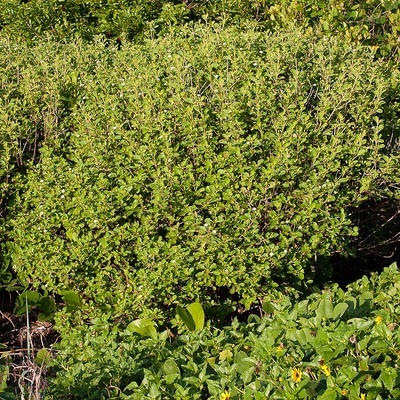 This Native Lantana is a dense coastal shrub with opposite leaves. The tiny flowers are pale pastel or white in congested heads nested in clusters of small leaves. 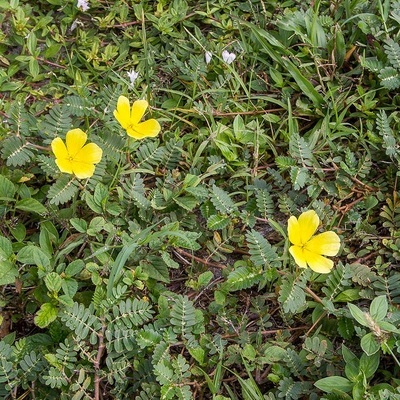 This native species differs from the invasive exotic horticultural Lantana camara by not being prickly, and by having pale flowers as opposed to usually bright yellow, orange, or reddish flowers. 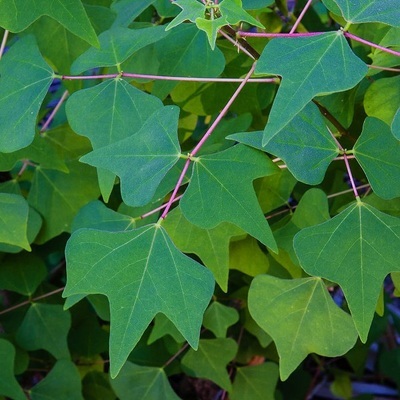 Abundant in dunes and hammocks, nickerbean is a thick heavy vine with huge multicompound leaves. 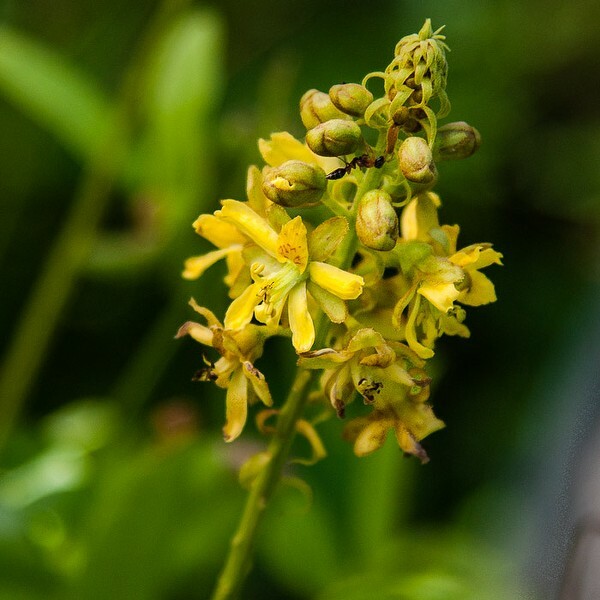 The plant is wicked thorny, and has clusters of yellow flowers. 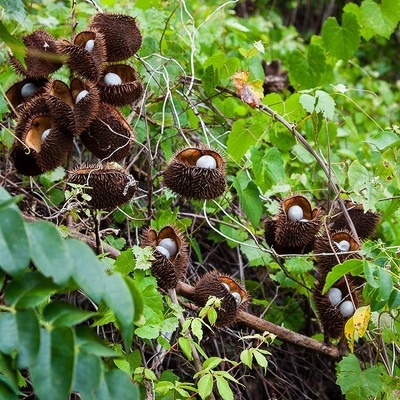 The interesting part is the pod, which resembles a big bristly clam. Inside are big smooth glossy gray seeds. 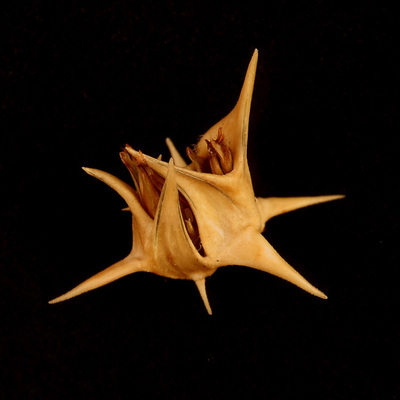 You sometimes see the seeds washed up on the beach. 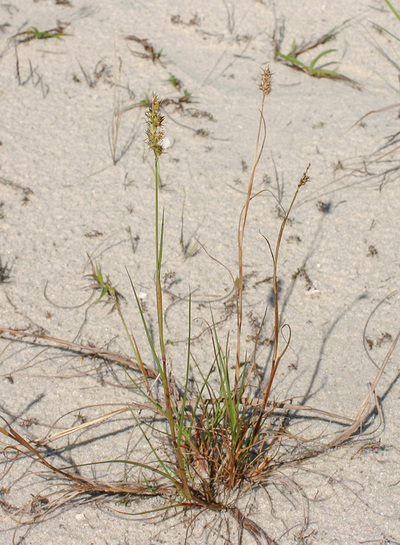 Puncture Vine is a common non-native weed on hot dry sand, including beach areas, also roadsides and parking lost. 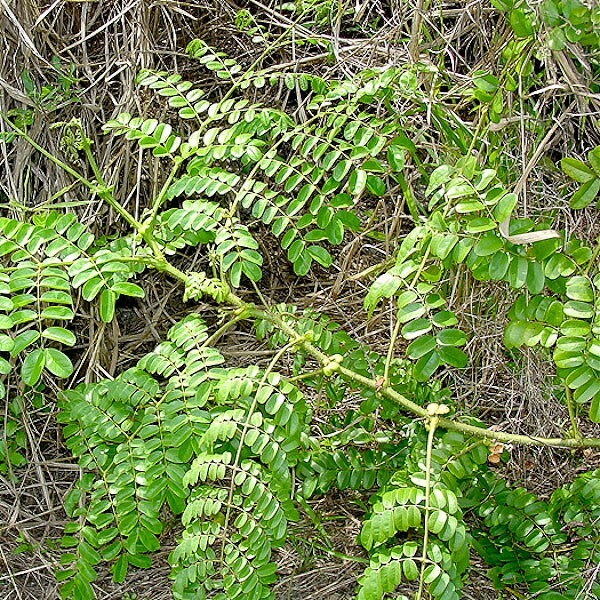 The ferny compound leaves are opposite. The blossoms are yellow buttercups, and the fruit is a spiny burr similar to that of sand spur. 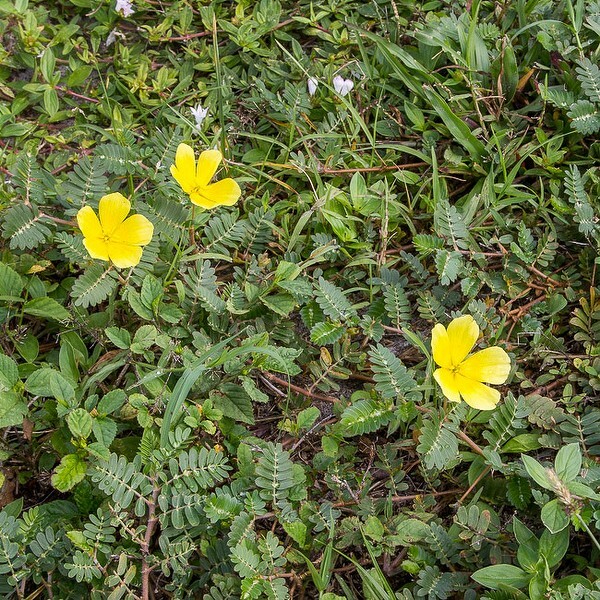 The flowers and the leaves track the sun. 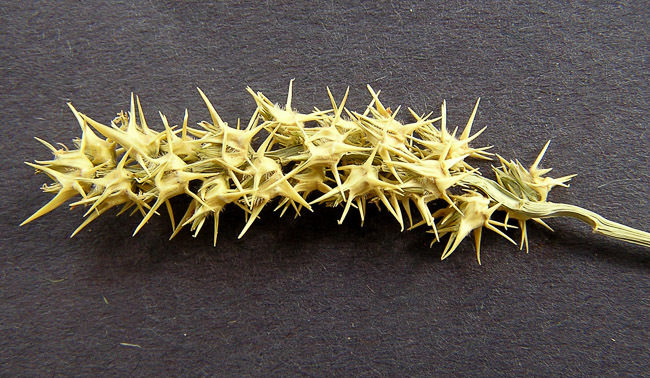 Sand Spur is a grass, usually on dry sand, having a spiny burr seed-cluster much like the fruit of Puncture Vine. Sea-Grape is no grape---it merely is a tree or shrub with edible grapelike fruits. Sea-Grape is related to Pigeon-Plum and the beautiful Polygonella wildflowers. 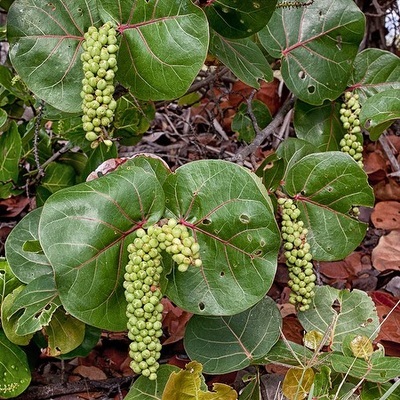 You can’t live in Florida long without encountering Sea-Grape in cultivation or wild on beach dunes. 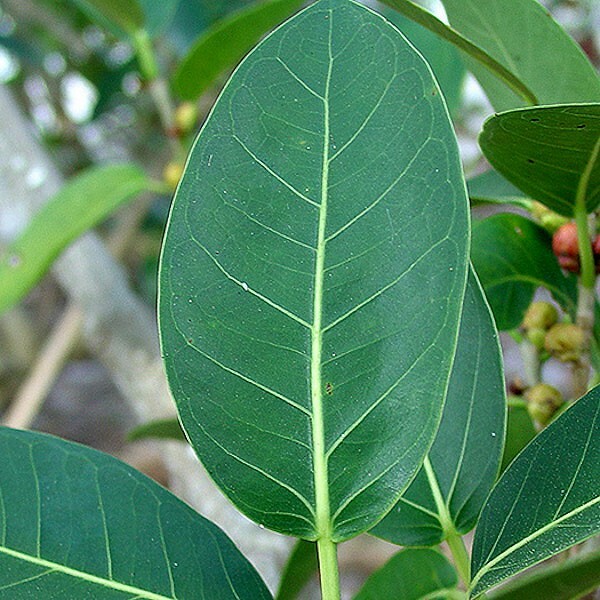 The stiff leaves resemble a dinner plate with red veins. 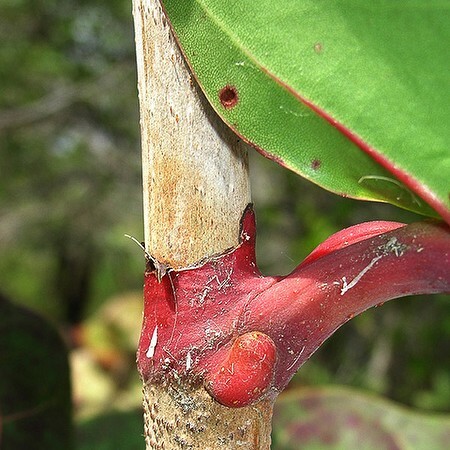 Look where the leaf stalk joins the stem---there is a cuff around the stem called an ocrea (OAK-ree-ah). 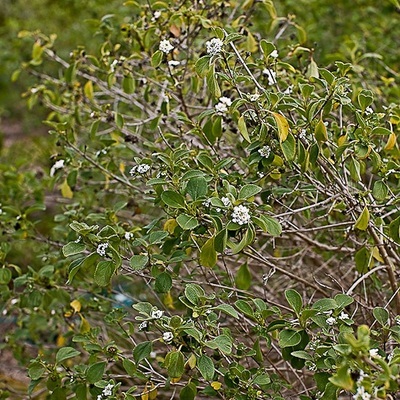 Pigeon-Plum has the same ocrea. The dangling fruit clusters mature into “grapes” similar to the real thing with more stone than flesh, however. Spider Lily prefers maritime dunes. It has a tuft of broad straplike leaves. 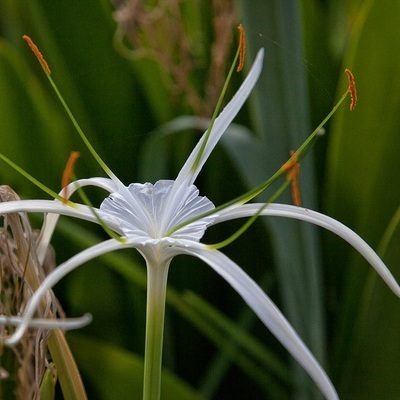 The flowers are bright white, with six narrow petals (tepals) joined basally by a white cuplike membrane. One of the more common and potentially largest broadleaf trees locally, especially in hammocks and on dunes. 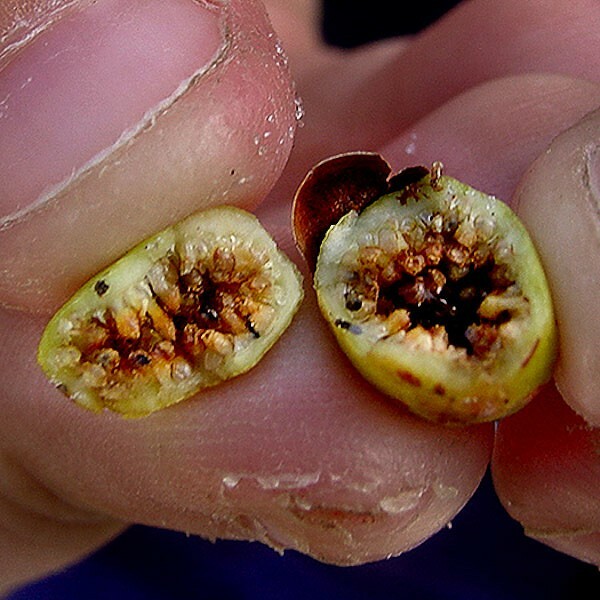 You can recognize all Figs, species of Ficus, by their milky sap and large dunce cap bud at the branch tip. 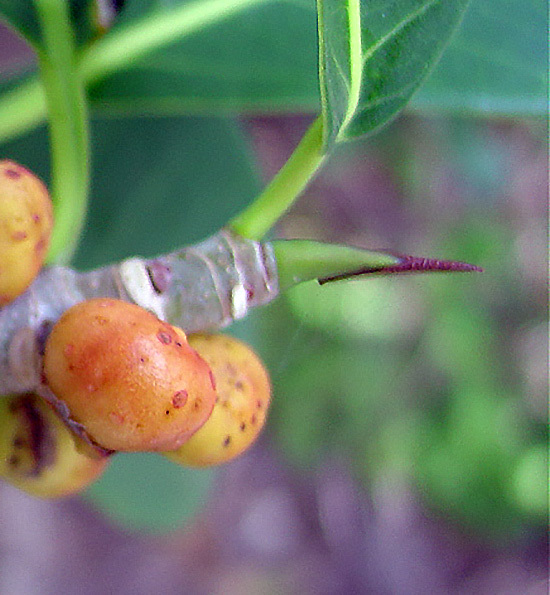 Strangler fig has orange marble-sized figs seated directly on the stem. 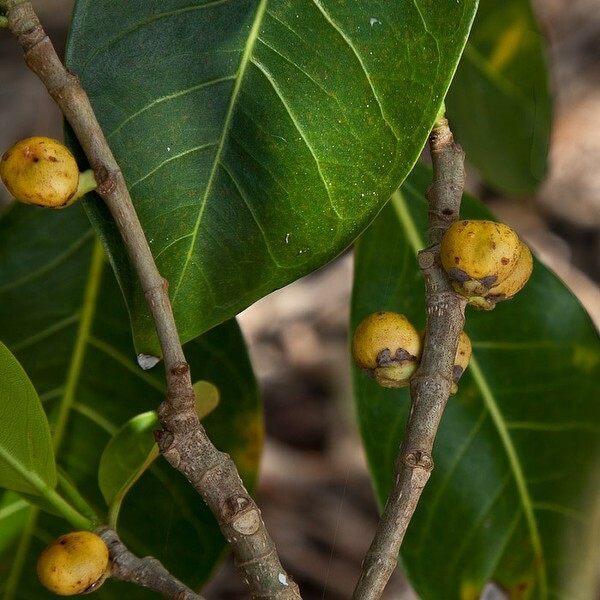 It is the only common native Ficus in our area. 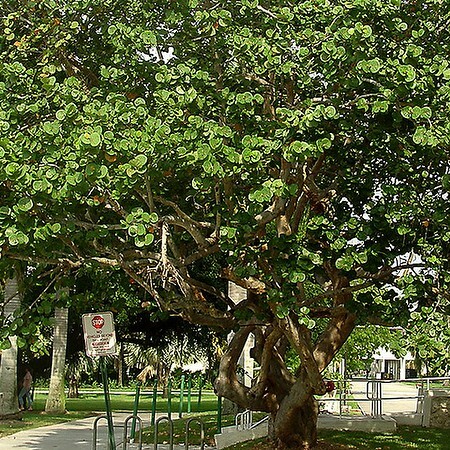 Strangler fig starts out as an airplant on its host tree, then eventually reaches the ground with its dangling roots. 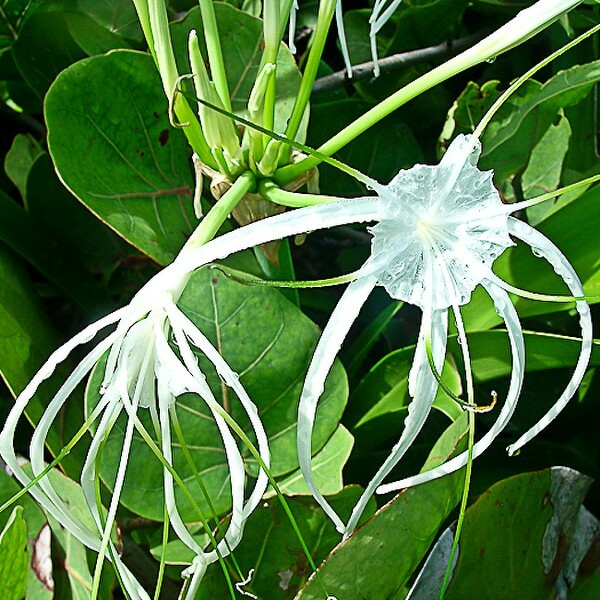 It does not strangle anything. This tough slow-growing shrub in the Coffee Family is gnarled, with its small opposite leaves in tufts. 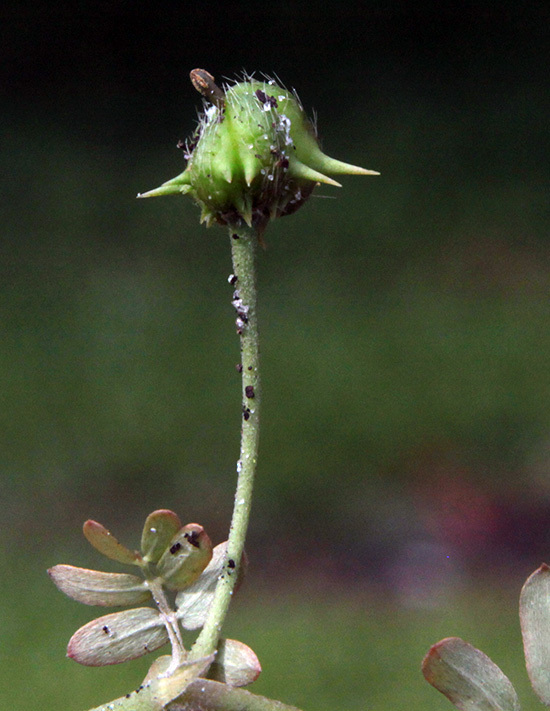 Thorns may or may not be present. 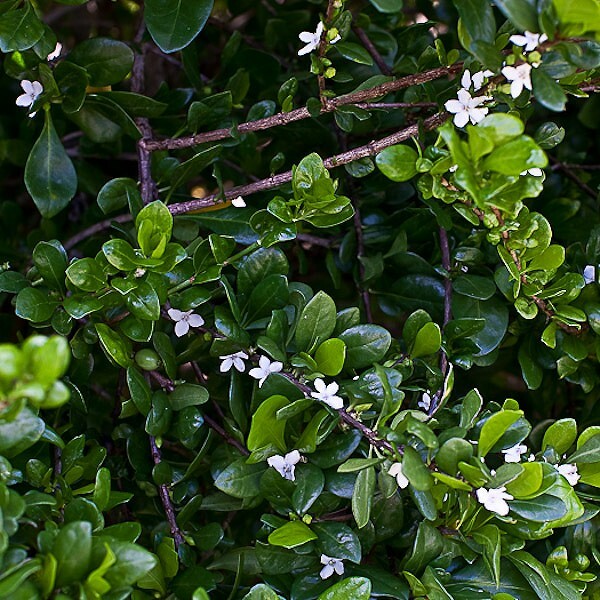 The star-shaped white flowers are about half an inch across. 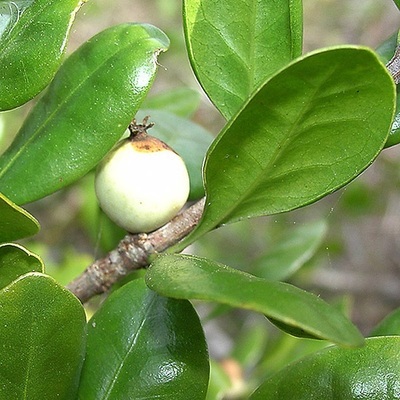 The berries the size of a small grape are white on the outside and dark blue or black inside. 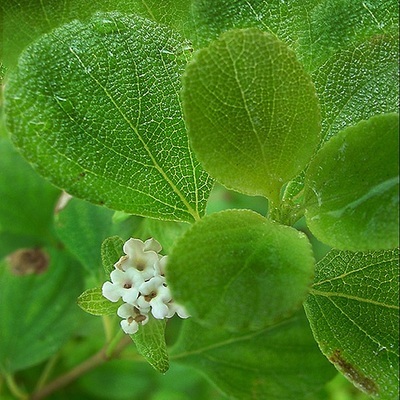 The related Snowberry has the berries white on the inside.